Problems that plague America’s water systems extend far beyond Flint and contain much more than lead. Nationwide, replacing aging water infrastructure could cost more than $1 trillion by 2041. 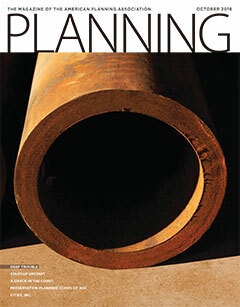 This month,Planning digs deep to examine the nation’s water woes and consider how planners can undertake a more influential role in water management. Plus, The Commissioner concludes a series on legal issues concerning form-based codes. The nation's water infrastructure crisis is bigger than Flint or lead. Madeline Bodin digs into the issue. With sidebars by Jake Blumgart and Kevin Ebi. A Crack in the Code? Form-based codes aren't the zoning cure-all many thought they'd be, but their emphasis on form has had a big impact, explains Alan Mammoser. Incorporation is on the rise, but there are growing pains, write Matt Wheelwright, Michael Johnson, Megan Townsend, and Casey Walrath. Lacking the trappings of a typical tech hub, Kansas City, Missouri, gets decidedly DIY, reports Greg Flisram. Web-only extra: Up From the Killing Floors. Elizabeth Watson looks at planners' roles in saving our treasured historic places. Melinda Woltenholme provides a sidebar. A regular column by Executive Director James M. Drinan. State ballots, Great Lakes water diversion, master-planned Irvine, California. A bimonthly department aimed at planning commissioners. Edited by Carolyn Torma. Timothy Beatley examines the nature-connected city. Mixed-income housing, segregation in Cape Town. Welcoming immigrants, urban renewal, Philadelphia. Infrastructure is crucial to resiliency.